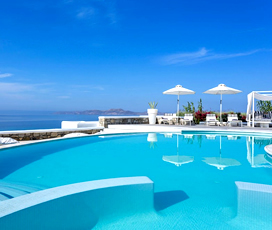 "Mykonos is one of the most luxurious of the Greek islands. 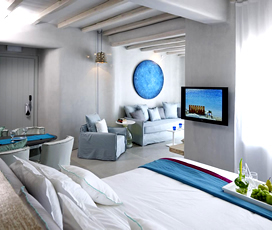 There are boutique hotels and designer shops galore on this paradise island." 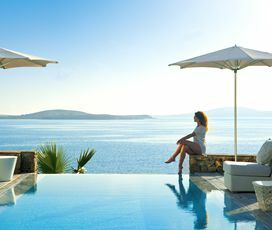 Mykonos is a beautiful Greek island, which combines a vibrant nightlife, stunning beaches and an interesting history, to create the perfect holiday package. 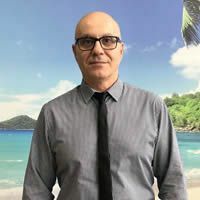 These days it is most associated with the many beach parties, which attract DJs from around the world, making it ideal for young people seeking a fun time in the hot summer sun. However, it is also blessed with a rich history, being within touching distance of the ancient holy site of Delos, birthplace of Apollo and his twin sister Artemis in ancient myth, ensuring that it is also great for people who enjoy cultural activities. 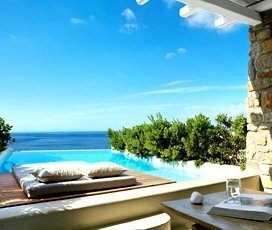 This, coupled with the islands many exceptional beaches that feature golden sands and azure waters, make Mykonos the kind of place, which everyone will enjoy on a beach holiday. 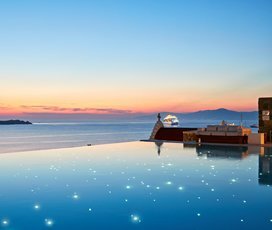 Chora, Mykonos’ capital, lies beside a picturesque harbour of yachts and fishing boats and offers an array of excellent shops, restaurants and nightclubs within a maze of tiny pebble-lined streets with white-washed steps and buildings. A visit to the historic neighbouring island of Delos, reached by local boat service, is well worthwhile. Here there are many fascinating archaeological sites to see. 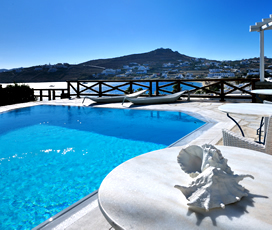 Like Mykonos, Delos is protected to preserve its unique natural and aesthetic beauty. The island features beautifully warm weather, gorgeous beaches, an exciting nightlife and fascinating history, so if you are searching for the place to escape the modern world, it may just be the place for you. 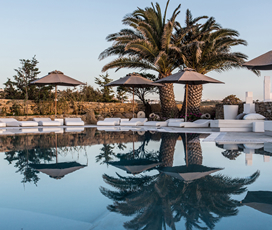 Book a stay at the Archipelagos Hotel from 25/04 - 31/05/2019 and get a FREE Upgrade to Half Board. Offers can be combined. Part of the islands in the Cyclades, it is situated in the Aegean Sea. 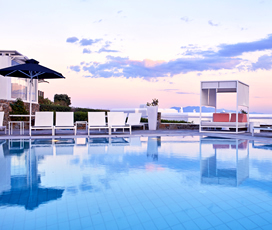 It is one of the most popular destinations among the Greek islands and is located around 150 kilometres from Athens. 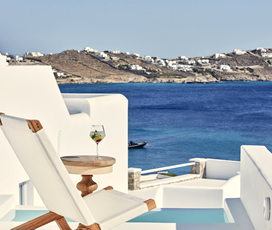 The capital of the island is known as Mykonos and it is famous for its cobbled narrow streets and blue and white splashes of colour. The island has an area of 105 kilometres and a population of just over 10,000. With excellent all-year-round weather, it is the ideal destination for a beach holiday. It gets more than 300 days of sunshine each year, significantly reducing the chances of rain, this is especially true in the summer months, when it is almost always bright and sunny. June, July and August are the hottest months of the year, although the weather between May and October is always good too. The island is believed to have been created by Heracles, who having defeated the giants, tossed them into the sea, where they were petrified and turned into large rocks, which made up the island of Mykonos. It is located within touching distance of the island of Delos, where Apollo and his twin sister Artemis were born. 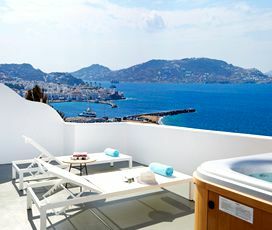 Mykonos itself was inhabited by Minoans for much of its early life, who were then succeeded by Phoenicians and Egyptians following the bronze age collapse. More recently it was a crucial Venetian shipping base, which was conquered by the Turks in 1537. It is now a modern tourist hotspot, famous around the world for its beautiful beaches and unrivalled nightlife. Cheese is the island’s most famous production. Some of the most flavoursome to sample include tyrovolia, a mild fresh cheese, a peppery cheese called kopanisti, a sour cheese called xinotyri, and a sweet cheese called louza. There is also noumboulo, a smoked pork fillet, alongside succulent, mouth-watering sausages. This combined with classic mezes and delicious fresh seafood create a cuisine, which everyone is sure to enjoy. Treat the family to its many beaches, such as the Agrari Beach, a child-friendly beach with calm shallow waters, watersports and a small playground, ideal for families. The main town of Chora is also an excellent place to take children, with a large number of family-friendly activities to enjoy on their family holiday. There is also go-karting available on the island, in Racekart land, which provides family fun for people of all ages. When visiting Mykonos, take a trip to the ancient island of Delos, one of the most sacred places in the ancient Greek tradition, which now acts like a history of Greek art and culture, thanks to the many statues which were donated to it. Little Venice, is also a vibrant neighbourhood, bursting with fun things to do, perched right over the ocean, a must for anyone on the island, along with the many gorgeous beaches and restaurants that populate its coastline. 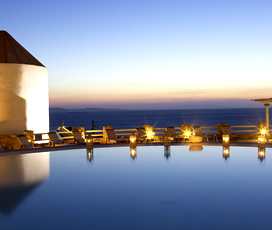 The nightlife in Mykonos is worldly known as having the best social scene in all of Greece. The clubs are fun and cosmopolitan, attracting international DJs from around the world, who perform in clubs that are open from dusk until dawn. 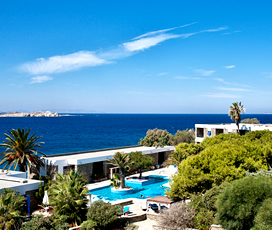 The most popular clubs tend to be close to the waterfront, with Paradise Beach, Super Paradise Beach and Psarrou Beach. 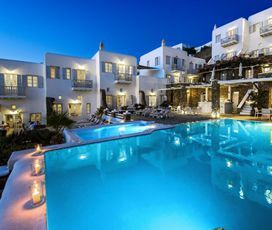 There is also many bars in Mykonos town and Little Venice, making it the complete night-time experience, which all visitors are sure to enjoy.